SAN FRANCISCO—June marked the American debut of another African musician, as the music continues to make inroads in this most difficult of markets. This time it was the Liberian singer Tecumsay Roberts, and he gave an impressive performance. Tecumsay hails from Monrovia where he began singing in high school. He spent much of his early career circulating between Monrovia, Freetown, and Abidjan, fronting a band called Liberian Dream. He recorded an album, Gettin’ It On, as well as the theme song for the 1979 Organization of African Unity conference held in Monrovia. He also spent some time in London singing with a group called Boombaya. In Monrovia he met an American promoter, Harold Bryant of Bamboo Records, who invited him to try his luck in the U.S. The show in San Francisco was opened by the veteran Rasta rootsman Ras Michael. The master Nyabingi drummer was backed by a local reggae band that laid down a solid groove for a spiritual set that praised Jah and railed against apartheid. Tecumsay, with his Ozinga band, was the main attraction, however, and the crowd was anxious to sample the talents of the newcomer. Tecumsay did not disappoint as he put on a two hour performance that can only be described as high energy. Starting with a splendid cover of Orchestra Makassy’s “Mambo Bado” he had the audience up and dancing for the rest of the performance. 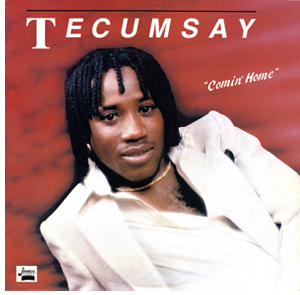 Tecumsay’s original material is an African Caribbean fusion he calls “Afrolypso,” and it was prominently featured, most notably with “Comin’ Home” which he has just released on a 12 inch, 45 rpm record. The show stopper of the night was a sensational version of the old calypso hit “Woman is Smarter,” during which Ozinga was razor sharp, stopping and starting on cue as Tecumsay danced through the audience singing the bawdy lyrics. The ten-member Ozinga features the acrobatic guitar antics of a famous son of a famous father, Rogie Junior, son of Sierra Leone’s S.E. Rogers “Rogie.” American drummer Anthony James is the band’s leader and arranger. The charismatic Tecumsay radiated charm, bantering with the audience, and strutting and dancing his way through the evening. With androgynous good looks and strong smooth voice, his presence is commanding. The concert ended with Tecumsay and Ozinga being joined on stage by Ras Michael for a spirited version of Bob Marley’s “Lively Up Yourself.” Unfortunately the show’s impact was not what it could have been due to a late start, a problem that seems to plague African and reggae bands here. Ras Michael didn’t begin his long set until after 10 p.m. so by midnight when Tecumsay came on many of the audience, who presumably had to work or attend classes the next day, had left without seeing the main attraction. For those who remained, Tecumsay gave a fine performance. With the right breaks, the future could be bright for this talented Liberian.